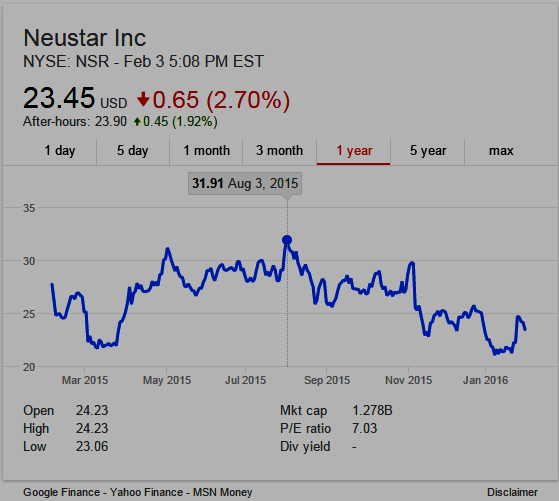 Domain name registry services and technology company, Neustar NYSE:NSR, Conference Call and Webcast to Discuss Fourth Quarter and Full-Year 2015 Results--Thursday, February 4, 2016, after the close of regular trading, to be followed by a teleconference and webcast beginning at 4:30 p.m. ET. To participate in the teleconference, call 888-801-6507 (international callers should dial 913-312-0726) and enter PIN 4887126 a few minutes prior in order to register. A replay of the call will be available through 11:59 p.m. (Eastern Time) on Thursday, February 11, 2016 by dialing 877-870-5176 (international callers should dial 858-384-5517) and entering PIN 4887126. "Revenue for the year totaled $1.05 billion, a 9% increase from $963.6 million in 2014. Marketing Services revenue grew 16% to $170.4 million driven by increased demand for the company's services that help its clients make informed and high-impact decisions to promote their products and services. Security Services revenue grew 20% to $168.0 million driven by the addition of new top-level domains and increased demand for the company's DNS services, particularly our DDoS mitigation services. The $27.7 million increase in Security Services revenue included $13.0 million from domain name registry acquisitions. Data Services revenue increased 2% to $204.5 million driven by an increase in caller identification services, partially offset by a decrease in carrier provisioning services. The $3.0 million increase in Data Services revenue included $6.3 million of deferred revenue recognized upon the expiration of the company's common short codes contract. NPAC Services revenue grew 7% to $507.1 million driven by an increase in NPAC fixed-fee revenue. "Revenue for the fourth quarter totaled $280.2 million, an 11% increase from $252.4 million in the fourth quarter of 2014. Marketing Services revenue grew 23% to $51.1 million. Security Services revenue grew 12% to $44.8 million. Data Services revenue increased 7% to $55.9 million. NPAC Services revenue grew 8% to $128.4 million. "The company completed its acquisitions of MarketShare Partners, LLC and the caller authentication assets from Transaction Network Services, Inc. in December 2015. MarketShare generated revenue of $2.7 million, and the acquired caller authentication assets generated $2.1 million. "Operating expense for 2015 totaled $763.4 million, a 9% increase from $702.3 million in 2014. This $61.1 million increase included $21.4 million in operating expense from acquisitions, comprised of $14.8 million in incremental operating costs and $6.6 million in depreciation and amortization. In addition, acquisition-related costs increased $10.9 million. Of the remaining$28.8 million, the company incurred an increase of $16.1 million for costs related to information technology and systems and an increase of $9.1 million in personnel and personnel-related expense. "Operating expense for the fourth quarter totaled $231.9 million, a 30% increase from $177.9 million in the fourth quarter of 2014. This increase included acquisition-related expense, costs related to information technology and systems, and royalty fees associated with the company's common short codes contract. "Liquidity and Capital Resources - As of December 31, 2015, the company's cash and cash equivalents totaled $89.1 million, a decrease of $237.5 million from $326.6 million as of December 31, 2014. This decrease of$237.5 million primarily reflects $758.3 million for acquisitions and $104.2 million for share repurchases, offset by the generation of $355.3 million in cash from operations and $336.0 million of net proceeds from the issuance of an incremental term loan. As of December 31, 2015, the company's outstanding debt under its credit facilities and senior notes was approximately$1.11 billion. From the Form 8-K filed Feb 4, 2016 with the SEC: "... potential risks and uncertainties that could cause future events or results to vary from those addressed in the forward-looking statements include, without limitation, the uncertainty of future revenue, expenses and profitability and potential fluctuations in quarterly results due to such factors as modifications to, terminations or expirations of, or failures to renew (or announcements related to any of the foregoing) the company's material contracts, including its contracts to serve as the Local Number Portability Administrator ..."